AA Skincare kindly these samples out for me to try out and give my thoughts on. 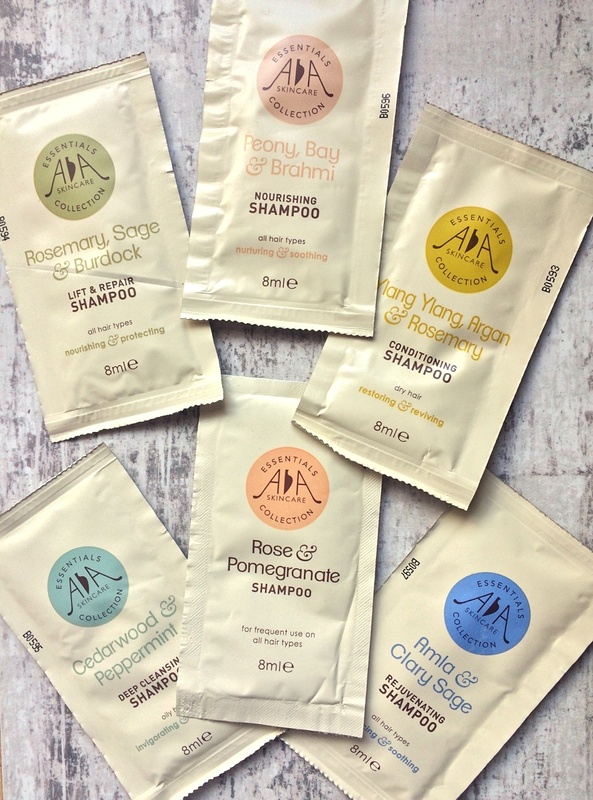 AA Skincare products are mostly vegan-friendly and none of their products are tested on animals. They sell a wide range of affordable products from hair care, skin care and bath and shower products. I have included the description of each shampoo and then I have wrote my thoughts underneath. "A naturally effective, nutrient-rich conditioning shampoo which can help repair split ends and encourage softness, shine and volume." First of all, I loved the smell of this shampoo. Very floral and fresh. It lathered up really well and my hair literally squeaked as I rinsed it out. I used my usual conditioner by L'Oreal afterwards. Once I'd dried my hair, I could notice it looking a lot more fuller and healthier. It also had a nice shine. Really liked this one! "Antioxidant and strengthening to give you gloriously glossy hair." So I didn't love the smell of this one but I didn't hate it either. I liked the fact that when I used the shampoo I could tell that it had deeply cleansed my hair and once I'd blow-dried and styled my hair as normal, my hair was so much more manageable than usual and it did give my hair a glossy finish. "An antioxidant rich shampoo with natural extracts to help repair damaged hair and promote a healthy scalp. Packed with vitamins and minerals to nourish hair, leaving it soft, shiny and strong." I really liked the smell of this one, it reminded me of products that are used at a spa, if that makes sense? My hair looked and felt very soft after using this shampoo. "A calming and balancing shampoo with natural Peony extract to help boost hair growth and maintain scalp health. Can help repair damaged hair and soothe irritated skin." I love peonies, so having a peony scented shampoo in these samples was a nice surprise. You can probably already guess but I loved the smell of this shampoo and it left my hair looking and feeling lovely. "A balancing and moisturising shampoo with vitamin C rich Amla (Indian Gooseberry) to strengthen roots. Naturally, soothes and protects against scalp irritations, leaving hair shiny and strong." I wasn't that keen on the smell of this one and I found it didn't lather up very well either. "An invigorating, naturally antimicrobial shampoo which also adds volume and shine. Rich in calcium, Vitamin E and amino acids to protect, nourish and strengthen oily hair." I saved this shampoo until last because I knew I'd love it! Cedarwood is one of my favourite scents (I have hoarded many Cedarwood candles and so on lol) and I like fresh and minty scent, so I knew this shampoo was pretty much made for me! It made my hair feel really clean and fresh, as well as moisturised. Overall I did really like trying out all these shampoo samples. My favourites were definitely the Cedarwood and Peppermint, Rosemary, Sage and Burdock and obviously the Peony, Bray and Brahmi ones. You can browse their website here. Have you/Will you be trying out AA Skincare range?